Additional Info: I have played flutes for over 30 years, mainly Bb marching band flutes but I also play Irish D flutes, and whistles. I published the Fluter's Companion books in 2008 and also the Complete Fluter's Companion in 2014. 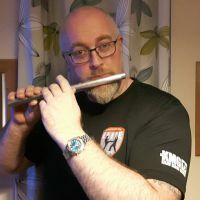 I make keyless D flutes from sturdy Aluminium under my own name Boyd Flutes and they are ideal for \Folk Music, Fife and Drum music or Irish Traditional Music.